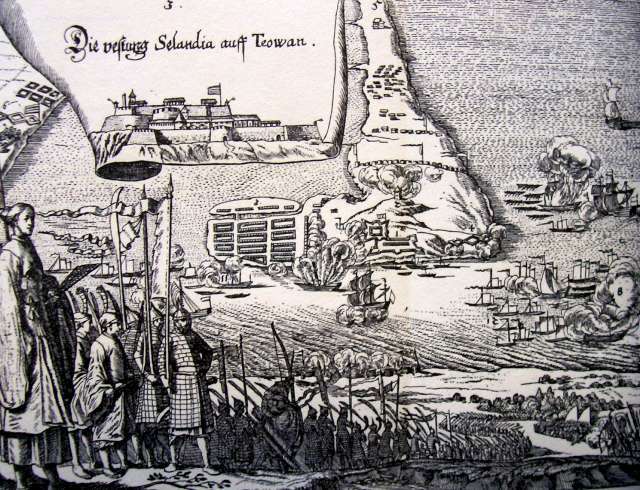 Impression of the siege of Fort Zeelandia from Herport’s Reise. We are looking south from Baxemboy. Number 1 is the fortress, number 2, hardly visible up on the hill, marks the redoubt Utrecht. Number 3 is the city, number 4 is the wooden bulwark the Company forces managed to set up in November. Number 6 is Sakkam and fort Provintia, on the other side of the water. Number 8 is the exploding Hector, attacked from all sides by Chinese junks. This was probably added just for dramatic effect, as the battle with the Hector took place on the other side of Baxemboy. Categories: Formosa, Taiwan, Zeelandia, Herport, Siege, map.